Israel and Hamas are locked again in combat likely to yield – beyond tragic life and property loss – a return to a destructive status quo. The immediate triggers were the kidnapping and murder of three Israeli yeshiva students, for which Israel holds Hamas responsible, and the revenge torture and murder of a Palestinian teen by vigilante Israeli Jews. The nature and extent of Hamas’s involvement in the initial obscenity remains unclear, but the attack’s consequences are anything but. 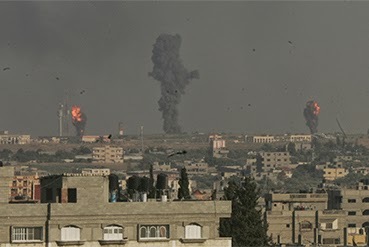 Since Israel launched Operation Protective Edge on 8 July, 168 Palestinians have been killed (80 per cent civilians, a fifth of whom were children) and about 1,150 wounded. Some 1,000 rockets have been launched toward Israel, of which about 200 were intercepted by the Iron Dome defence system. Previous rounds ended with each side claiming at best a Pyrrhic victory, because Israel can achieve lasting stability only when Gaza does, and vice versa. Breaking this pattern is even more urgent today, because the stakes of this escalation could be higher. The reconciliation agreement of 23 April 2014, signed by Hamas and the Palestine Liberation Organisation (PLO), led principally by Fatah, offers both a further challenge and an opportunity. The situation in Gaza has deteriorated markedly since then. The new PA government formed on 2 June was supposed to take over governance in Gaza but has not. The Strip runs on administrative inertia, since the new ministers have not assumed their responsibilities. An estimated 43,000 employees, hired since Hamas took over Gaza in 2007 and who still largely run the Strip, have not received their salaries in months; in frustration, they have prevented some of the other 70,000 employees – who were not hired by Hamas and in most cases had been paid by the Fatah-dominated Palestinian Authority (PA) on the West Bank to stay home during those years in order to weaken the Hamas government – from obtaining theirs. Electricity, fuel and medical supplies have grown scarcer. Now that conflict has erupted, the flux in the Palestinian political system introduces a new variable into efforts to achieve calm. But the reconciliation agreement might also hold the key to squaring the ceasefire circle. Though opposed by Israel, the deal, if implemented, offers the best chance of alleviating Gaza’s misery and lessening Hamas’s incentives to fight. The Islamist movement long resisted admitting any PA presence, but now that it has renounced governance, a door has been opened, and with it, an opportunity to redesign the peace process and advance the well-being of Gaza’s 1.7 million residents. Hamas for the foreseeable future will continue to be the de facto security authority on the ground, even if reconciliation moves forward; indeed, reconciliation will need to be implemented in a manner that does not wholly abandon or alienate the employees hired by Hamas and thereby trigger new civil strife. Continuing Gaza’s isolation, however, would do nothing to loosen the movement’s control. And should it, it would only be in the direction of jihadis. Hamas, in tacit cooperation with the new PA government, should ensure acceptance and maintenance of the ceasefire by all Palestinian factions in Gaza, as well as the safety and security of the personnel of all agencies there. These steps will not be sufficient to achieve a permanent Israel-Gaza ceasefire, much less a lasting Israeli-Palestinian peace agreement, but without them, neither will be reached.